Compare prices on car hire in Montpellier Airport from all the major brands and find the best deals. When you book through us, unlimited mileage and insurance are always included in the price given. Montpellier – Méditerranée Airport (MPL) is located 7 km southeast of Montpellier . There is a bus that runs between the airport and Montpellier, but it is not often that a taxi is a good option. Avis, Budget, Europcar, Hertz, National and Sixt quote car rental. 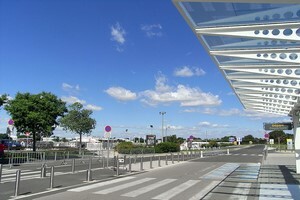 In 2005 visited more than 1,300,000 passengers Montpellier – Méditerranée Airport. It is served by Air France, but mainly by budget airlines such as Ryanair and easyJet. Most destinations are within France with around 14 daily departures to Paris.There are international routes to London , Madrid , Frankfurt and Amsterdam . Despite the fact that the airport is small, it has a good selection of shops. There are, among other things, a specialty shop for French wines. The airport has two cafes / bars and a gourmet restaurant. Montpellier – Méditerranée Airport is also equipped with wireless internet, ATM, a business center and a hotel at the entrance to the airport.